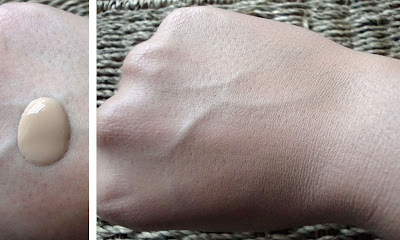 B U B B L E G A R M: Bourjois: Healthy Mix, round pot e/s and mini pigment Review! I like to look if the mini pigments. I have never seen them in store but will take a look. 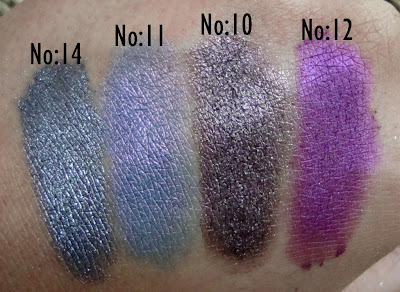 #07 of the shadows, and #11 of the pigments look really pretty! Thanks for comparing those two foundations--when I get around to picking up another foundation (it will probably be a while, as I'm finding it takes forever to finish just one! ), I'll def consider the 10 hr sleep effect. This review is great - the pigments really look like they're worth it! 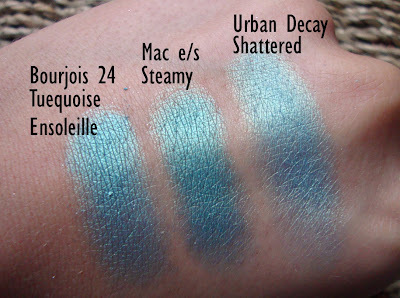 I dislike Bourjois eyeshadows - I never knew that you're supposed to apply them wet - guess that would have been helpful! 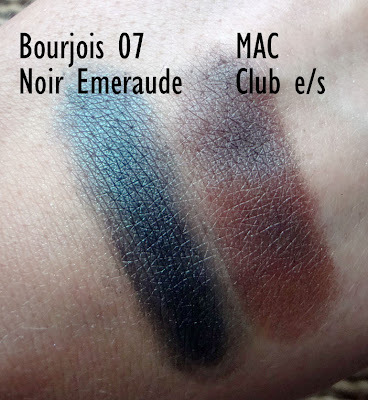 I agree with bourjois round pot eyeshadows not eing very pigmented..i personally do not want to buy an eyeshadow that i have to apply wet to get the colour as in the pot. I have many of the pigments from their mini colection and i love them. They are really good quality, size and great prices too. Thanks for the foundation review..i wanted to try it but seeing as you said its not dewy, i think il give it a miss. 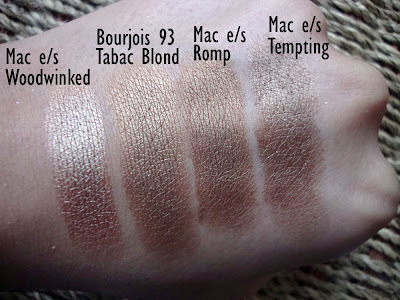 Bourjois round pot eyeshadows are baked, that might contribute to the poor pigmentation of the swatches when used dry. By the way, is it just me or is it true that when an eyeshadow pot gets in contact with water, the surface gets ruined and then it can't be used dry? Great swatches! I like your comparisons with other brands. 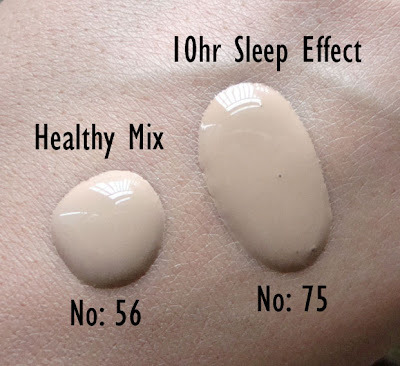 I really like the Healthy Mix Concealer, used for undereyes, have you tried that yet? My skin is quite pale so the colour is good for me. I have a Mini Boujoirs pigment #12 and I like it. They have good quality and long lasting. And they're cheap! Thanks for the review of the foundation. @cbsg5861 if the eyeshadows are baked, it's ok to get them wet, but say when a normal mac eyeshadow gets wet it can ruin it and the layer has to be scraped off. @Jody ooo great news for you with the pink tones then. I didn't get the concealer as there wasn't one suitable for my skin shade, they might send me one later to review. 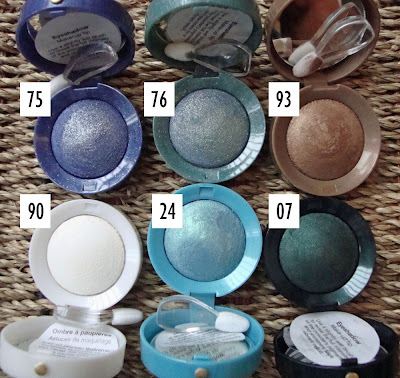 These pigments and eyeshadows are gorgeous! Thanks for the review! i love the mini pigments...the round pots seem like i would def have to wet them to like them ...!! Those shadows look lovely and very pigmented! I have been wanting to try out their foundations, esp the 10 hr one you always recommend! 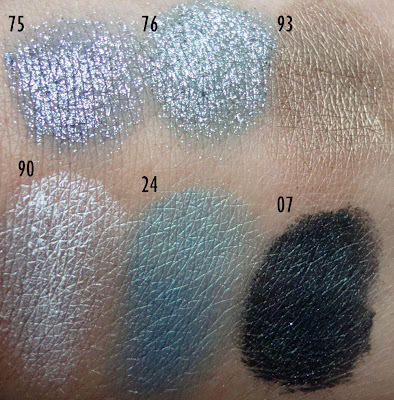 Great review and swatches - the pigments look great and are really good value too! I was looking at the Little Round Pot Eyeshadows today and had no idea they were supposed to be used wet. I'm surprised how poorly pigmented they are when swatched dry. Thank you so much for this post! I have tried out a few Barry M dazzle dusts and i like them but a cheaper alternative is always good to know about! 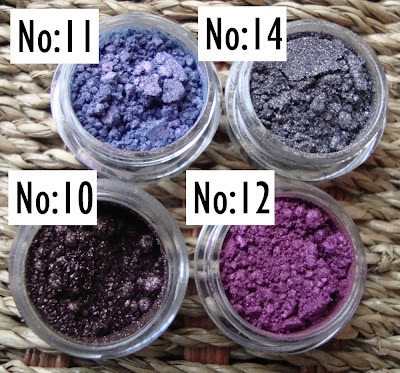 I think 10 and 11 of your pigments look gorgeous! Are they available in superdrug? Oh and thank you for the swatch of Macs Club e/s, been wanting to buy this for a while but wasnt too sure of the colour payoff! Is it nice on green eyes? I love posts with lots of pics so this was a great one! 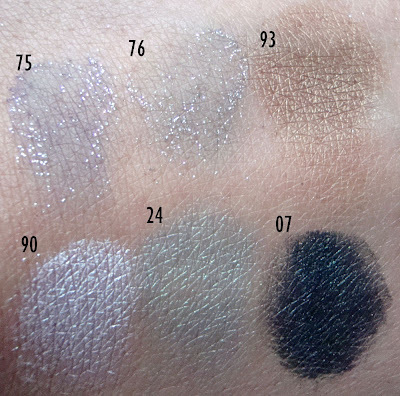 The Bourjois pots swatches are really disappointing dry, but they sure do come alive when wet! I much prefer the look of the mini loose shadows. Wow, looove these swatches!! Shame it's not sold her in the states, at least I doubt it, I've never seen it! Hello! Came across your blog via Aainabridal.com, and I actually just bought the Healthy Mix Foundation. I was quite impressed with it because it matched SO well with my skin tone, and that's something I've always had issues with. I've tried everything from liquid to mineral, Armani to Almay. Perhaps the type of primer used will affect how it sits on the skin? I use Laura Mercier's oil free version. It also seems that a little bit goes a long way with this foundation, and the more you blend it, the better it looks. With the Lilas d'Or blush, it looks great. Wow I can't believe you found the healthy fix foundation to be matte! I tried it out today and it was VERY dewy on me, bordering on shiny/greasy!